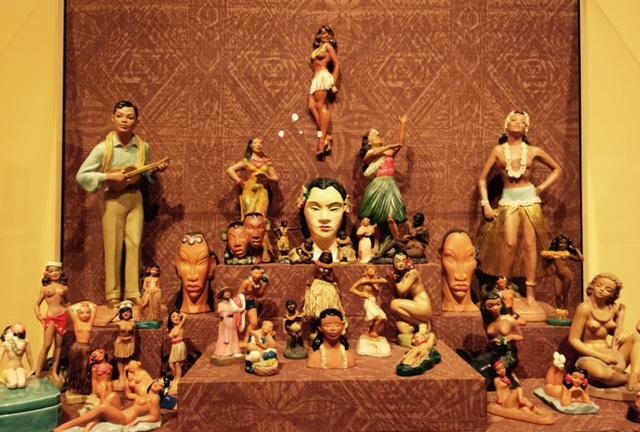 Objects from the Art Deco Hawai'i period, largely from the collection of Michael Horikawa. 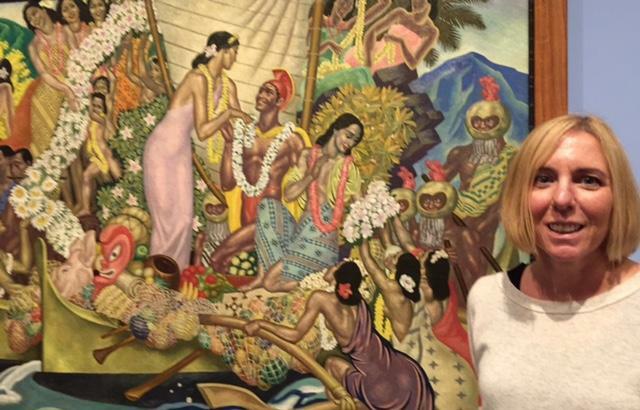 Theresa Papanikolas, curator of European and American art, curator of Art Deco Hawai'i, with a panel from Eugene Savage's Matson mural. "Figure Composition", Marguerite Blasingame, wood. Her stone carvings taken from the wood compositions are seen, for example, at Ala Moana's McCoy Pavillion and at the the Honolulu Board of Water Supply main office. "The Three Graces", Esther Bruton, painted screen. A conversation with Honolulu Museum curator Theresa Papanikolas and with music host and historian Harry B. Soria about the Art Deco period in Hawai'i, roughly the 1920's through the 40's. The radio story closes with Alfred Apaka singing “Nalani” by Alvin Kaleolani Isaacs. Harry B. Soria, a third generation radio guy in Hawai‘i, provided a colorful audio backdrop for the Art Deco Hawai‘i show. Find more music of the period on Territorial Airwaves, now celebrating its 35th anniversary.